Tropical Cyclone Idai is poised to move inland over East African countries that were already soaked by flooding rain from the same storm system earlier this month. 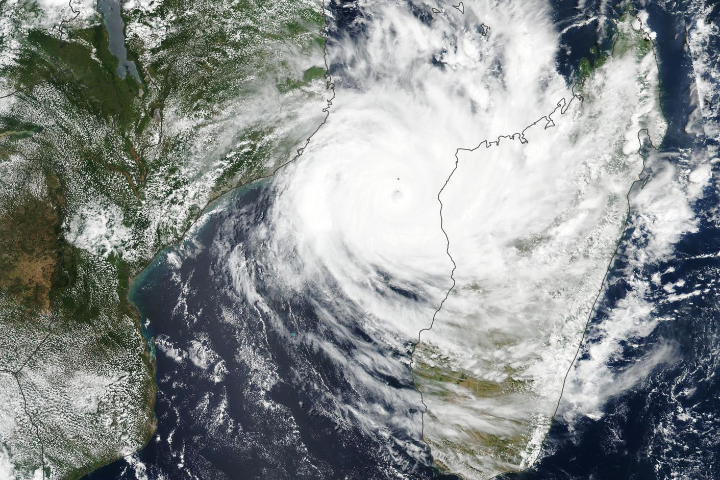 The Moderate Resolution Imaging Spectroradiometer (MODIS) on NASA’s Terra satellite acquired this image of the cyclone on March 12, 2019, as it spun across the Mozambique Channel. 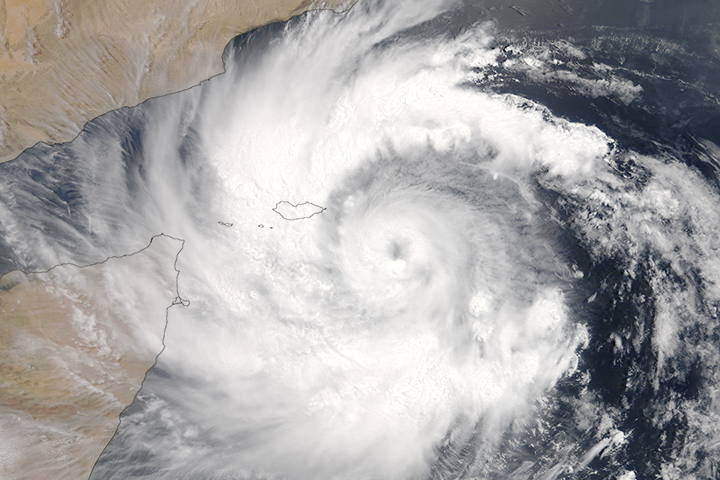 Around this time, the potent storm carried maximum sustained winds of about 90 knots (105 miles/165 kilometers per hour)—equivalent to a category 2 storm on the Saffir-Simpson wind scale. The storm system first developed as a tropical disturbance on March 3 and grew by March 5 into a tropical depression with winds measuring 30 knots. 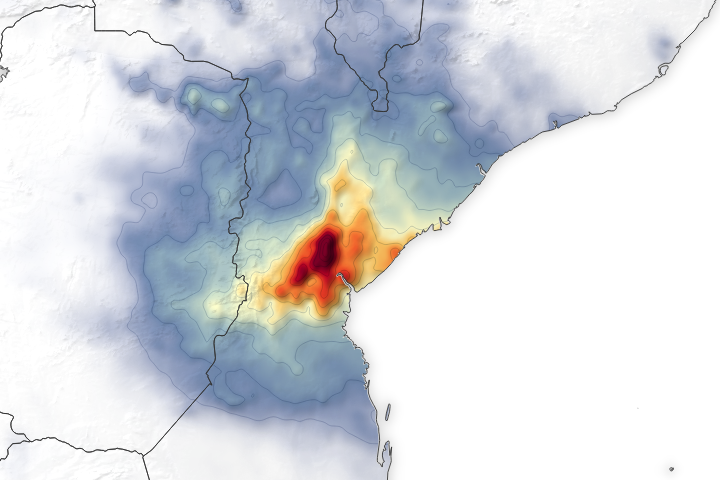 In the process, it dropped heavy rain on Mozambique and Malawi and spawned deadly floods. By March 11, the storm had tracked eastward into the warm channel between the coast of Africa and Madagascar, where it strengthened into an intense tropical cyclone. Now on a southwestward track, forecasts call for Idai to reach Mozambique by March 14-15, bringing a second round of wind and heavy rain to the region. “Several cyclones in the past have started over Mozambique and then moved over water and intensified into more organized systems, although this type of situation is not common,” said Corene Matyas, a researcher at University of Florida who has studied cyclones in this area. It is relatively common, however, to see cyclone tracks in the Mozambique Channel that meander and loop, due to weak steering currents. Cyclones that form in the channel tend to be weaker than those that form over the Southwest Indian Ocean, north and east of Madagascar. But Matyas points out that regardless of where a cyclone forms, some have reached their highest intensity within a day before landfall. 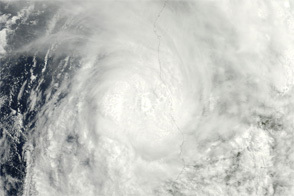 Tropical Cyclone Eline in February 2000, for example, passed over Madagascar and the Mozambique Channel, and then quickly intensified just before landfall in Mozambique. Most tropical cyclone activity in the Southwest Indian basin occurs between October and May, with activity peaking in mid-January and again in mid-February to early March. Idai is the seventh intense tropical cyclone of the basin’s 2018-2019 season. 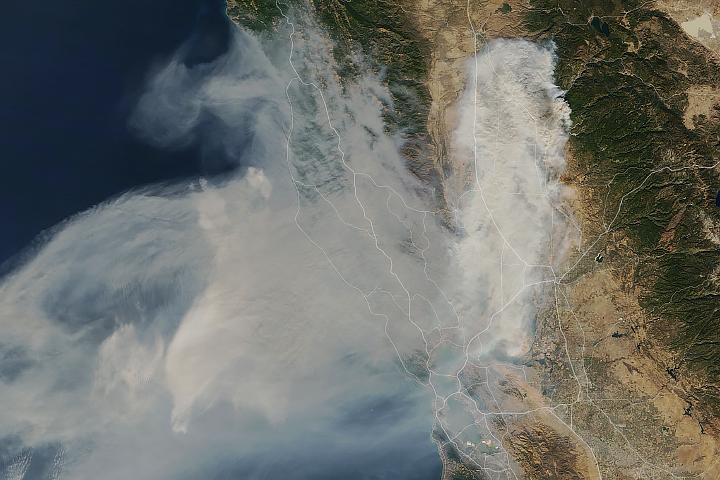 NASA Earth Observatory image by Lauren Dauphin, using MODIS data from NASA EOSDIS/LANCE and GIBS/Worldview. Story by Kathryn Hansen. 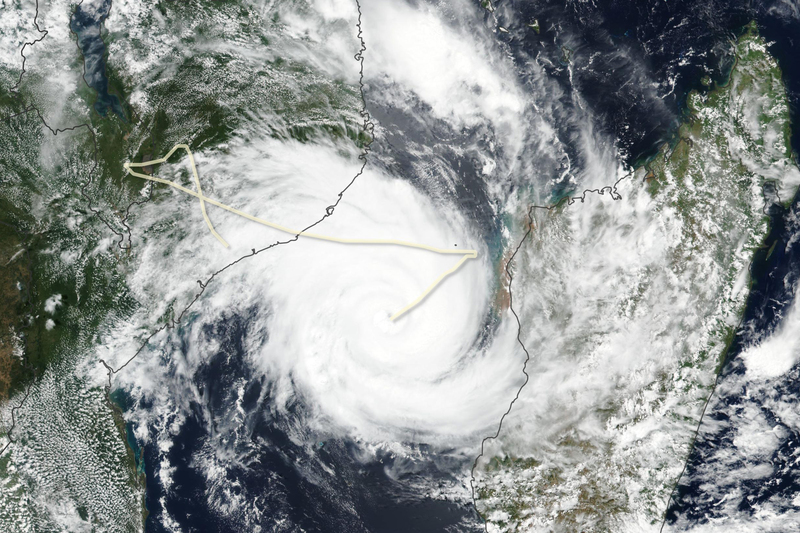 The tracks of tropical cyclones in the Mozambique Channel often meander and loop. Most tropical cyclone activity in this basin tends to occur between late October and May. Joint Typhoon Warning Center (2019, March 11) Tropical Cyclone 18S (IDAI) Warning #10. Accessed March 11, 2019. Matyas, C. J. (2014) Tropical cyclone formation and motion in the Mozambique Channel. International Journal of Climatology. 35 (3), 375–390. Memeburn (2019, March 11) What you need to know about Tropical Cyclone Idai, set to strike Mozambique. Accessed March 11, 2019. Météo France (2019, March 12) La Réunion. Accessed March 12, 2019. NOAA Central Pacific Hurricane Center, Tropical Cyclone Climatology. Accessed March 12, 2019. Reason, C. J. C. and Keibel, A. (2004) Tropical Cyclone Eline and Its Unusual Penetration and Impacts over the Southern African Mainland. Weather and Forecasting. 19 (2004), 789–805. 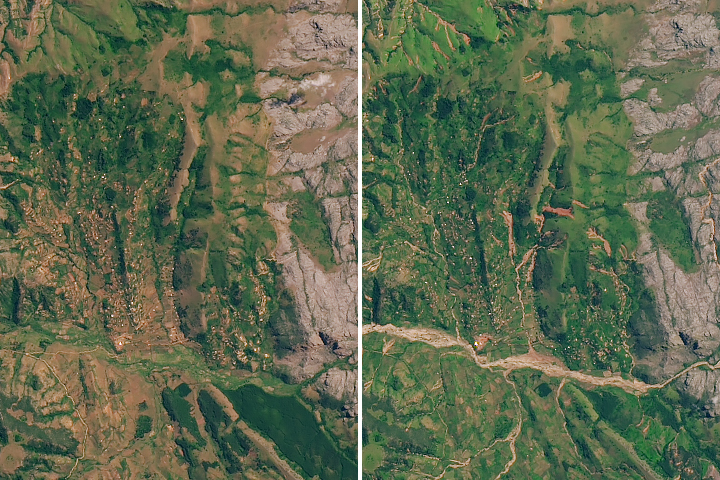 Reuters (2019, March 10) Death toll from Malawi flooding rises to 28, almost 227,000 people affected. Accessed March 11, 2019.